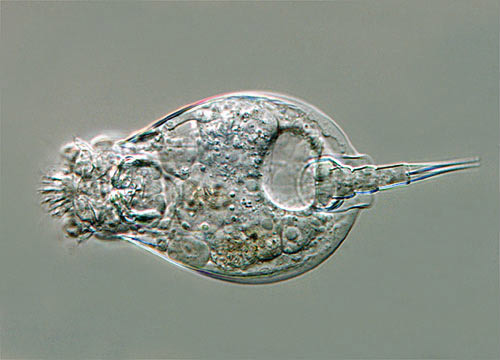 Rotifers are extremely common and can be found in many freshwater environments and in moist soil, where they inhabit the thin films of water surrounding soil particles. Their habitats may include still water environments, such as lake bottoms, as well as rivers or streams. They are also commonly found on mosses and lichens, in rain gutters and puddles, in soil or leaf litter, on mushrooms growing near dead trees, in tanks of sewage treatment plants, and even on freshwater crustaceans and aquatic insect larvae.